Like your description higgins, especially the part with the additional "emphasis" benefits that come with proficiencies which make them truly unique. I for one am even more teased now than I was before! Last edited by EinBein on 12 Jan 2016, 15:04, edited 2 times in total. The trick is to stop thinking in terms of rigid categories of skill based on the specific weapon. Proficiencies are styles of fighting. For a more relatable example, look at unarmed combat. In real life, you wouldn't go train a fists skill. You'd learn a system of some kind. The properties, advantages, and disadvantages of that system would be different based on whether you learned boxing, aikido, krav maga, or classical Greek wrestling, yet all of these are using the exact same weapons - hands, feet, elbows, knees. Proficiencies represent not just what you're fighting with, but how you've been trained to fight. I could take our codex and write up the same curved one-handed sword with the same profile and use it with multiple proficiencies. If I was more interested in getting some shield-based advantages, I'd be better off with Sword & Shield, because it's all about shield work. If I was more interested in taking advantage of the curved sweep of its blade, Sabers would be the most useful proficiency. If I was using a close-up, aggressive style, I'd go with Messers. If I want something with a lot of flexibility, and to take more advantage of companion weapons? Sword & Buckler. The proficiency I would want to learn is based on what exactly I want to do with it. It's not just about what I'm fighting with, but how I want to use it. Even with something as specialized as a rapier (which is normally begging to be under the cut-and-thrust Sword & Buckler category) I could definitely justify using it with Sword & Shield under the right circumstances. I might want to grab a rotella. When we're not talking about swords, this gets much easier. Whether you're fighting with a spear or a pollax, it's all about staff-fighting for the most part. The style of fighting is basically dictated by the physical properties of being a long haft with an attacking surface at one end, so it it's Polearms. If it's a weapon that's chiefly about hitting them with the heavy end, it's a Mass Weapon. In addition, both Polearms and Mass Weapons have shield techniques built into them, for spear-and-shield or axe and shield type stuff. Daggers is fairly specific, but it does what it does well. Brawling brings up the rear as kind of a catch-all for both any unarmed combat, and for things that don't quite fit any other example (such as hitting someone with a chair). Brawling does however have multiple emphases from which you can choose to better represent whether your character is more of a wrestler, a boxer, etc. This was very important point that proficiency names are not actually literal (in all cases) but how you use a weapon or a pair of weapons. I am sure it will be clear in the document. This was JUST uploaded. Coincidence? I don't think so. He's watching us, all right. Among other things, Matt Easton talks about using one type of weapon in different ways. Oh, absolutely, especially since grappling is such an important part of European martial arts. Grab is a basic maneuver, so, one can enter the grapple (or indeed perform throws!) from literally any proficiency without being handicapped. EinBein wrote: I just still wonder about advanced shield manoevers with mass weapons/spears and shields as those weapons need the shield to counteract parrying weaknesses of the main hand weapon even more than the swords do. Sorry, I read both your posts like three times and I still don't know what you're asking. higgins on emhpasis in Sword & Shield proficiency wrote: On the other hand, with Sword & Shield, shield strikes and binds you initiate using a shield are always counted as advantaged -- which promotes a completely different fighting style. Every proficiency benefits from such unique Emphasis. Agamemnon wrote: If I was more interested in getting some shield-based advantages, I'd be better off with Sword & Shield, because it's all about shield work. ... just for the combination of either mass weapons or spears with shields. Both styles change significantly if you are using them with or without a shield but aren't represented by separate proficiencies. This is in my humble understanding implying that they don't get the same amount of shield-specific manoevers as the Sword & Shield proficiency and/or an Emphasis that would support the use of mass weapons / spears with shields. But if you are using a two handed woodcutter's axe, you'll use completely different manoevers than a viking with a small-headed one-handed axe and round shield (or the same with buckler in the Scottish Highlands during your intended timeframe). Agamemnon wrote: Whether you're fighting with a spear or a pollax, it's all about staff-fighting for the most part. The style of fighting is basically dictated by the physical properties of being a long haft with an attacking surface at one end, so it it's Polearms. I would completely disagree on this. For centuries, the spear was the weapon of choice (much longer than the sword's short history as mainstream weapon), because of the small amount of metal needed to make it deadly and thus the small cost for the rank-and-file barbarian/greek hoplite/frankish foot soldier. But they were more often than not used in combination with a huge shield. If you hold such a weapon in one hand and a shield in the other, the set of available manoevers is completely changed compared to the staff-fighting Agamemnon is referring to and which might apply to Swiss Guard with halberds or the like. The differences are much bigger than those between messers and sabres imho. Agamemnon wrote: In addition, both Polearms and Mass Weapons have shield techniques built into them, for spear-and-shield or axe and shield type stuff. But as there is so much depth put into those many different blade fighting styles, it makes we wonder why Mass Weapons and Polearms are mixing everything in an attempt to have every possible use in just one (or two) proficiencies. I assume this is because (1st) the focus of your game, (2nd) the scarcity of detailed sources about the fighting styles in question and (3rd) the lack of manoevers that one is able to deduct because of (2nd). And Marras asked if there are any two-weapons manoevers hidden in some of the presented proficiencies like used in the broadsword and dirk fighting style of the scottish highlands (I know they came into use not before the 18th century). I feel like a lot of this is simply talking past each other for not having the shared context of the documents in front of you (something to be soon remedied). But it really wouldn't be that hard to make new proficiencies, given the way they are currently written. I suspect the biggest challenge might be coming up with interesting emphases for them. I know that's something Higgins and I sunk far too much time into when we were at that phase. Let's look at spears for a moment. In quite a few places in history, we know that people used spears and shields. This was a very common battlefield setup. On the other hand, I've heard from a lot of people that this is somewhat unwieldy in other contexts. I couldn't produce the source off of the top of my head, but I recall some greek or roman text talking about men dueling with spears often using them without shields, and a number of "experimental archeology" and reinactors will talk about the same. Of course, we also know as you get later into history, people dropped the shield entirely and used the spear with two hands. So for the purposes of making a game, should spear and shield and spear by itself be two proficiencies? I guess you could do it that way, but it's going to be a pain when I'm making my hoplite character and I need to buy two different proficiencies to account for whether I've got my shield handy or not. It might be more realistic, but I'm not sure it would be fun. Then we looked at polearms. This is a good place to actually discuss, as there is a case you can make for spears and polearms to be two separate categories. There is, however, a significant degree of overlap in how you see the two used, so for simplicity we decided to roll them into one - which is why presently Polearms as a proficiency has shield maneuvers it can use. The same goes for Mass Weapons, really. A number of battle-axes could be used two-handed, or they could be used one-handed with a shield. We didn't see any real reason to make that two separate proficiencies, even if the exact maneuvers you would use is a little different depending on whether or not you have a shield. If I have a bigger two-handed axe (say, a dane-axe) a lot of what I'm doing is going to be very similar to the slightly shorter two-handed axe. Yeah, I'm accounting for reach and heft a little differently, but we're talking about the same basic ideas involved. This is a good place to go back to the idea that the proficiencies represent styles more than they represent weapons. If I have a great big Dane axe, I could choose to use it as a Mass Weapon, or I could choose to use it as a Polearm. Depending on which I went with, I would have slightly different maneuers and two different emphases. If you want some real fun, look at something like a staff which could be used with the Mass Weapons or Polearms proficiencies, but if a longsword player turned around and said he wanted to use a short staff (say, four and a half feet or so) with his longsword proficiency, I could very easily see someone doing it. To contrast, the difference between some of the sword-type proficiencies isn't about "what they are equipped with." Sword & Shield could be a sword by itself, a sword and buckler, or a sword and a larger shield - but it's going to get the most out of the sword and a medium or large shield, because that's where it's focused. On the other hand, Sword & Buckler could use a sword by itself (the same sword I could be using for Sword & Shield) or it could be using a buckler in the off-hand, or a dagger in the off hand, or a short-sword, if you really wanted to. The big benefit of the Sword & Buckler style is how flexible it is. What a lot of this boils down to is that where we could (particularly if it wasn't a specific focus) we wanted the proficiencies to be more distinctive and cover more. Broad strokes with strong identities. Saber and Messer kept their thing because they had very interesting and strong identities in terms of how the weapons were used. EinBein wrote: And Marras asked if there are any two-weapons manoevers hidden in some of the presented proficiencies like used in the broadsword and dirk fighting style of the scottish highlands (I know they came into use not before the 18th century). Actually, it was not a question but rather a remark that even though the proficiency is called Sword & Buckler in practice it can be broadsword & dirk that would not have been easy to see just from the name. Hmm... would sword and a hatchet use the Sword & Buckler proficiency or Sword & Shield because hatchet is larger than dirk? Agamemnon wrote: This is a good place to go back to the idea that the proficiencies represent styles more than they represent weapons. If I have a great big Dane axe, I could choose to use it as a Mass Weapon, or I could choose to use it as a Polearm. Depending on which I went with, I would have slightly different maneuers and two different emphases. This looks very flexible to me. It will take some time to get accustomed to but I am sure it will be much more fun than rigid weapon skills. As much as I loved to play Rolemaster back in the day, it really sucked if you couldn't get your hand on a particular weapon you could use. It just occured to me is there any reason not to use some sort of club as an off-hand weapon instead of dagger? Could you still parry with it as well as with dagger? Hypothetically this could give more diversity to attacks and what kind of damage is dealt. Or to drag this thread screaming back to improvised weapons, if a rapier user chooses to equip a chair as an improvised shield? Excellent points Agamemnon, especially the point about a Quarterstaff being able to swap between Mass Weapon and Polearm proficiency. The only thing I am not understanding is why Double Edged Sword gets Shield (or Buckler) proficiency and maneuvers for free, while everyone else has to either default to their main weapon's maneuvers or double spend on proficiency points. It would be difficult to argue that Axes, Messers and Sabre fighting styles didn't have just as many shield maneuvers as Double Edged Swords do. If the argument is historic, I don't think it holds water. In the case of Axes specifically, historically the majority of Vikings would have used Mass Weapons and not Double Edged Swords. In a Viking setting, would the Proficiency list read: Messer, Sabre, Double Edged Sword, Mass Weapon & Shield, Mass Weapon & Buckler? Right now it is a mixed bag. The Double Edged Swords get Shield for free, and other weapons have to either double spend or use the limited maneuvers of their main weapon. And there is currently no way to learn to use a double edged or thrusting sword without it being bundled with shield, like a rapier duelist would have learnt. Or if all the shield maneuvers are actually identical for all single handed weapons, then listing "& Shield" with only one type of sword is just confusing. Last edited by thirtythr33 on 13 Jan 2016, 10:45, edited 1 time in total. Agamemnon wrote: I feel like a lot of this is simply talking past each other for not having the shared context of the documents in front of you (something to be soon remedied). Without "TM" after "soon"... So it's a real soon!!! thirtythr33 wrote: The only thing I am not understanding is why Double Edged Sword gets Shield (or Buckler) proficiency and maneuvers for free, while everyone else has to either default to their main weapon's maneuvers or double spend on proficiency points. The weapons that were used in conjunction with large shields such as Polearms and Mass Weapons get shield maneuvers anyway. In fact, when breaking up "double-edged sword" into Sword & Shield and Sword & Buckler, we're forcing you to make a more specific choice on HOW you use your double-edged sword. thirtythr33 wrote: I think the obvious thing to do would be to entirely divorce the "& Shield" part of sword and just list "Double Edged Sword" and treat it exactly as you do for Messer and Sabre. a) Broadsword as a term can't replace Sword & Shield, as that word is so convoluted to be essentially meaningless. b) Arming Sword as a term can't replace Sword & Shield, as it would insinuate that gladius-wielding Titus Pullo would need use some other proficiency. Plus vikings weren't using arming swords either. c) Sidesword as a term can't replace Sword & Buckler. I.33 -- the quintessential sword & buckler treatise -- specifically uses arming swords, which should be covered by the term. Also, rapier isn't a sidesword either. d) Rapier -- again, too specific. e) Cut-and-thrust Sword also won't do, as most arming swords are basically cut-and-thrust swords, so, that also puts arming swords solidly into one camp or another, which should not happen. f) One-Handed Sword won't do as it encompasses both. g) Double-Edged Sword also won't do as it also encompasses both, as well as the vast majority of hand-and-a-half, as well as two handed swords on top of that. Plus there's this. g) And this needs to be modeled somehow. higgins wrote: In fact, when breaking up "double-edged sword" into Sword & Shield and Sword & Buckler, we're forcing you to make a more specific choice. Interesting, I hadn't thought of it from that direction. higgins wrote: Now, if you're saying that you have better terms to offer for "Ragnar-style fighting" and "D'artagnan-style fighting" than we've come up with, then I'm all ears. * Spada Da Lato. If you are afraid of using words from other languages, perhaps change Messer to be Falchion. * Narrow sword / Straight sword. 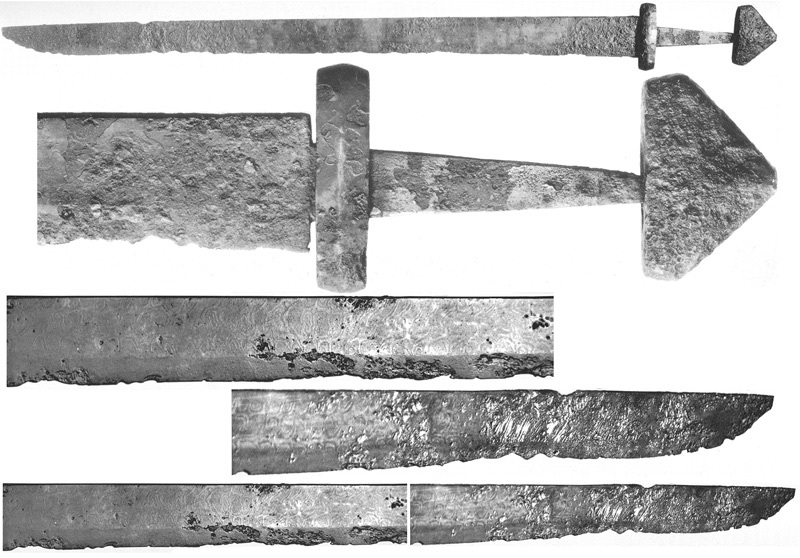 Differentiated from Tapered Sword below. * Cut and Thrust. Probably not enough people are familiar with this term but it applies. Might also be confused with Sword and Shield. * Fencing. I have a feeling this will be disqualified because the treaties that use the word also taught non-sword weapons... Even though Italian Fencing or French Fencing would be almost perfect. * Rapier. Seems perfect? Refers to single or two weapon (including buckler) and can thrust or cut. Very D'artagnan. * Tapered Sword. Not a term I have heard others use, but it seems fairly accurate. * Short sword. Kind of as nebulous as broadsword, arming sword or sidesword. * Knightly Sword. Someone will complain Romans and Vikings are not Knights. * War-Sword. Certainly has that brutal connotation. Edit: Bah, you edited in shutdowns for Rapier and Cut and Thrust. You might be being too picky, no matter what you call it you are going to have contradictions and ambiguities just because of the really terrible terminology we have for swords. As it stands Sword & Buckler and Sword & Shield have their own share of problems. thirtythr33 wrote: Bah, you edited in shutdowns for Rapier and Cut and Thrust. I finally remembered what that item was that I forgot! And then I spotted that although I said that rapiers aren't sideswords, I thought I should clarify that the reverse is also true. thirtythr33 wrote: Spada Da Lato. If you are afraid of using words from other languages, perhaps change Messer to be Falchion. That's just Italian for "sidesword". Also, messer and falchion are completely different things. thirtythr33 wrote: Narrow sword / Straight sword. Differentiated from Tapered Sword below. thirtythr33 wrote: Rapier. Seems perfect? Refers to single or two weapon (including buckler) and can thrust or cut. Very D'artagnan. Discounts both sideswords and all I.33. I considered dueling sword for a heartbeat, but clearly vikings had their duels as well. As did knights. thirtythr33 wrote: Tapered Sword. Not a term I have heard others use, but it seems fairly accurate. Virtually all swords have a taper. Either a distal taper, or a lateral one.